OWN: Oprah Winfrey Network is acquiring the rights to air “T.D. JAKES” from TEGNA Media and T.D. Jakes Enterprises. “T.D. 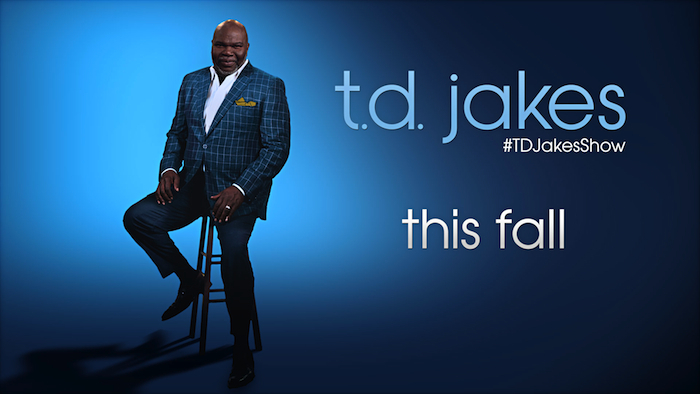 JAKES” is the new syndicated daily one-hour talk show hosted by T.D. Jakes. Seventy affiliates will premiere the show locally on September 12, followed by OWN’s launch of the show on Monday, September 19. The network will air “T.D. JAKES” Monday through Friday at 6 p.m. ET/PT. Produced by 44Blue Productions, EnLight Productions and T.D. Jakes Enterprises, the show is currently filming in Los Angeles with Ianthe Jones serving as showrunner. “Oprah and OWN have a wonderful, long-running relationship with Bishop Jakes,” said Erik Logan, President, OWN: Oprah Winfrey Network. “We are thrilled to welcome his new talk show and unique, inspirational voice to the OWN family. T.D. Jakes is one of America’s top pastors, a best-selling author and visionary thought leader whose entertaining wit and signature wisdom will help viewers navigate critical issues of our times. In addition, T.D. Jakes has an extensive and loyal following. More than 11 million strong, his social “village” turns to him daily for inspiration. The show will deliver social audiences original and interactive content experiences across Facebook, YouTube, Instagram, Twitter and more. This entry was posted in Reviews, World News and tagged 44Blue Productions, Oprah, OWN, Talk Show, TD Jakes, TEGNA Media by Kris Patrick. Bookmark the permalink.